Title text: It's a myth that you can never cross mountains safely, but be sure you understand how the climatic situation there will affect your parent thunderstorm. 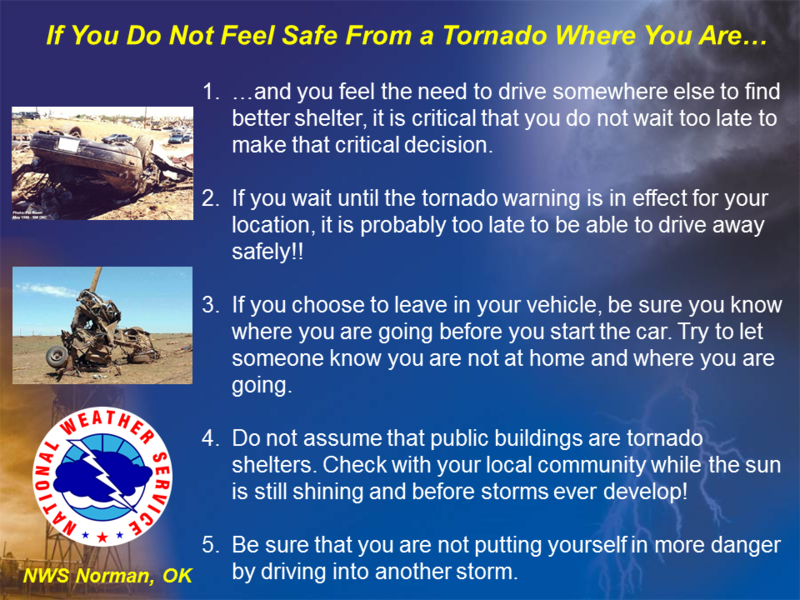 The comic features a Public Service Announcement (PSA) poster, which generally contain public-interest messages aimed at raising awareness or steering behavior around a specific issue of concern, that in this case contains tips for tornado safety. 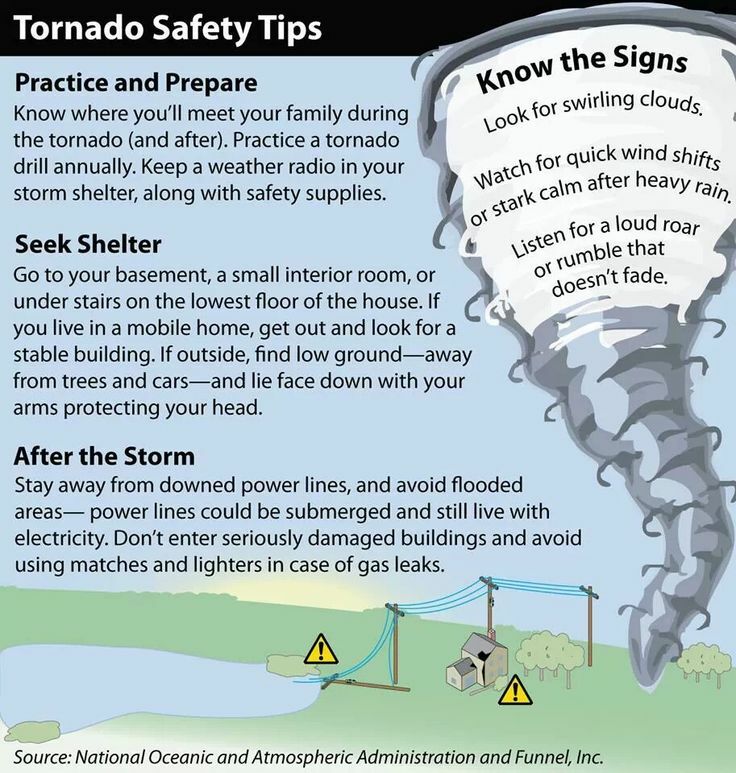 Typically, a poster labeled "Tornado Safety Tips" would be filled with instructions for how humans can stay safe in the event of a tornado, such as "stay away from windows," "go to the lowest floor of your home," "if in the open, take shelter in a ditch," and so on, see these examples: Example 1 (with same title as comic), example 2 and example 3. Black Hat on the other hand, has flipped this on its head by publishing a poster that contains safety tips for the tornado itself and contains information for how tornadoes can stay safe, i.e. continue to exist, see the table of tips below. The joke is that just as, for example, a "climber safety" poster is directed at climbers, the "tornado safety" poster is directed at tornadoes. It is thus in no way helpful for people who actually live in an area that experiences tornadoes or even for people that don't live in tornado-prone areas but want to be ready for their possible occurence. It is not possible to follow most of the guidelines, as they are intended for tornadoes. But the advice a human could follow would only take you towards places which can sustain tornadoes. Instead they should choose to use an app like the one in 937: TornadoGuard. The title text simply adds more tornado advice for tornadoes, bringing up the common myth about tornadoes not crossing mountains, except from the tornado's perspective. Although this is clearly not a tip for humans, the idea of tornado safety tip is yet another tips comic. Tornadoes are a recurring subject on xkcd. The tornado in this comic is similar to the picture used in the Tornado version of 1037: Umwelt. Avoid low-lying cool air Supercells, and particularly tornadogenesis, requires highly buoyant air near the surface to, put simply, provide the energy and rapid upward motion for to their growth and maintenance. Tornadoes, being small scale features on the scale of the atmosphere and requiring fairly extreme conditions to form, are particularly sensitive to shallow layers, perhaps even a few hundred meters of less buoyant (i.e. cooler/dryer) air near the surface. If a tornado encountered such a layer of air, it would be quite "dangerous" to its survival, as sufficient depth and exposure would likely disrupt the tornado's circulation and perhaps even dissipate it completely. Keep your downdrafts and updrafts from mixing Strictly speaking, this statement is only entirely true on the larger scales of a tornadic storm (though to some extent updraft/downdraft interaction is crucial to the process on the scale of the actual tornado). Generally, it is for exactly the lack of this that tornadic supercells are able to gain such intensity and last many hours, whereas a typical individual storm cell has a life-cycle on the order of less than an hour. Any given storm cell is composed of an updraft, warm, moist air moving upward and forming clouds, and a downdraft, the corresponding movement of cooler air downward, often bringing heavy rain with it. If this downdraft is superimposed directly over the parent updraft, as would occur in a calm atmosphere with no substantial differences in wind with height, it will suppress the storm's updraft very quickly, and the cell will die a rapid death. However, if the winds change quickly enough with height (vertical wind shear), this displaces the updraft and downdraft so they don't interfere as directly, resulting in a longer lived storm. Nevertheless, the cold air moved downward by the downdraft will eventually spread along the surface and choke off the flow of warm air to the original updraft, however, this denser air may force more warm air to rise, starting the cycle anew, albeit with a new storm cell. This is how squall lines work (see below), along with more typical multi-cell clusters. Still, this results in no one cell being "dominant," remaining strong for any great length of time, and growing past a certain point, all factors that preclude significant tornado formation. However, if the vertical wind shear is particularly strong, with very strong winds aloft going in near the opposite direction as winds near the surface, this causes horizontal rotation in the atmosphere (think a pencil rolled between two hands). A particularly strong updraft can lift this rotation into the vertical, and soon the entire storm begins to rotate. Through rather complex physics, this allows the storm to more cleanly separate its updraft and downdraft, and continuously propagate into warm, buoyant air. This process and the updraft/downdraft separation it creates is associated with nearly all dangerous tornadoes, and is what distinguishes a supercell from other types of thunderstorms, and if such separation is not properly maintained, it will likely "kill" the storm's tornado chances including any currently in progress. However, it bears pointing out that a specific type of downdraft interacting with a tornado, called Rear flank downdraft (RFD), actually may play a crucial role in tornado formation, carrying this rotating motion (vorticity) down from higher levels of the storm and feeding it into the tornado. Therefore, if a storm's RFD is too weak or does not interact with the core of the storm's updraft, a tornado is not likely to form or maintain itself. However, if the RFD is too cold/strong, it will indeed cut off the tornado's supply of warm air (see below), and regardless of type the RFD does eventually tend to "kill" the tornado after some length of time, which is why any individual tornado only lasts for a short amount of time. Seek out warm and humid surface air layers Hot, humid air near the surface is vital for tornadoes to form, as it provides the "fuel" for their parent storms as well as tornadoes themselves. Any thunderstorm, large or small, begins as an updraft, a column of warm, moist air moving upward due to its positive buoyancy (i.e. lower density, think a balloon or heat rising from the pavement on a hot summer day). Due (mostly) to its temperature, once the air is less dense than its environment, it will start moving upward, and will continue to do so as long as it stays that way. However, air cools as it rises as it expands under lower pressure, generally speaking at a faster rate than the surrounding environment does. This is where the moisture comes in, as once the air cools to the saturation point, where it can hold no more water vapor, water begins to condense into tiny liquid droplets to form clouds. This process releases latent heat to the surrounding air parcel, and thus in a suitable environment with sufficient cooling with height, this rising air starts to cool slower than its surroundings, and continues to rise on its own. The warmer and wetter the air relative to its surroundings, the faster it can rise, and thus the more intense storms it can feed. Further, once a storm forms and begins to rotate (see above), the tornado itself, being an extremely intense, rotating updraft near the ground, is "fed" by very warm and moist air at the surface and thus would want to seek it out to survive. Don't let rain-cooled air choke off your circulation As discussed above, if a storm's downdrafts are too strong, they can block the supply of warm, moist, buoyant (rising) air that feeds a tornado which will cause it to dissipate or never fully form in the first place. On the storm scale, this type of supercell is termed "outflow dominant", it generally maintains itself but too much rain cooled air present at the surface is preclusive to tornado formation. On the tornado scale, the buoyancy of the storm's Rear Flank Downdraft, RFD, is believed to play a crucial role in tornadogenesis. It is this air that carries high-vorticity, i.e. rotating air down from aloft to enable the tornado to have such an intense circulation near the surface, as updraft parcels beginning near the surface otherwise have little preexisting rotation. However, if this air is too cold and dense, which is typically a result of evaporative cooling and water loading from rain, it can choke off the supply of warm air to the tornado's circulation, and reduce its overall buoyancy, this "killing" the tornado, which is generally why they dissipate. Avoid letting your supercell merge with a squall line Supercells, the powerful, rotating thunderstorms that produce nearly all strong tornadoes, generally like being left alone. Other storms compete for the same warm, moist air that the supercell needs to fuel its continued development, and the cold downdrafts produced by such storms can also choke off a supercell's supply. Furthermore, interaction with other storms, particularly strong ones can disrupt the complex physical processes that keep a supercell going, particularly those delicate ones that lead to and sustain tornadogenesis. A squall line is a particularly potent threat in this regard, and probably the biggest "killer" of supercells in this specific regard. Squall lines, well known as the culprit behind most of the violent derecho windstorms, are long lines of thunderstorms that can, as a larger-scale feature, last many hours and travel thousands of kilometers. They generally occur when environmental conditions allow one or a few storms to combine the cold, dense air in their respective downdrafts in such a fashion that it moves rapidly and spreads out in a linear fashion, forcing warm air up right ahead of it to form clouds and additional storms. This then creates new downdrafts that contribute to this "cold pool", as its called, continuing the process. While squall lines can occasionally produce weak, short-lived tornadoes along their leading edge, they generally lack the rotation and individual persistence necessary to form proper "twisters". Their fast motion, large size, sizable cold pool, and all-consuming hunger for warm, moist air and resultant tendency to gobble up storms in their path make them a mortal threat to the generally slower-moving, freedom-loving supercells, and their resultant tornadoes. An encounter with a squall line almost never ends well for tornado and they should avoid such a meeting if they strive for longevity. However, it is interesting to note that storm interactions, occasionally even with squall lines, can briefly enhance tornadogenesis if conditions are just right, but this rarely has a sustained positive impact on the tornado's long-term survival prospects. Title text: It's a myth that you can never cross mountains safely, but be sure you understand how the climatic situation there will affect your parent thunderstorm. In a style perhaps evoking that of a safety warning for a pharmaceutical drug, the title text reminds tornadoes that while it is indeed false that tornadoes are not able to cross mountains (while rough terrain can sometimes disrupt the very low-level circulation, there is nothing intrinsic to mountains areas that prevent tornadoes from moving over them), the tornado should be cautious that the environment on the other side of the mountain should still be supportive of the parent supercell and the broader processes keeping the tornado "alive." This is a valid concern because, generally speaking, the more mountainous areas of the United States generally tend to have less favorable environments for supercells and tornadoes, but this isn't always the case as the title text notes, particularly for more local-scale terrain.